The Columbia full-time MBA program is intended to be completed across two years of study. The academic calendar is divided into three 12-week terms: the fall term begins late August to early September, and after a six-week break between terms, spring term commences in early-mid January. Those who enter in August typically complete an 8 to 12-week internship in the summer between the first and second years and graduate in the spring of the second year, whereas a smaller group of “J-Term” students enter in January and complete their MBA throughout four consecutive terms, taking courses throughout the summer and graduating with their August-entry peers the following spring. These summer courses begin in late May and conclude with exams in mid-August. The Columbia full-time MBA program requires a total of 60 credits that consist of an 18-credit core curriculum and a minimum of 42 elective credits. At the beginning of the program, students are divided into clusters, groups of 60 or so peers who take most of the first-year core courses together. Each cluster is then broken into five- to six-person learning teams who work together on class projects. Clusters and learning teams are designed to reflect the diversity of the class as a whole and to help students form closer relationships with each other. The core curriculum consists of two full courses and nine half courses. These full courses are typically worth three credits each, whereas students earn 1.5 credits for half courses. For three of these half courses, students must choose one “flex core” option from each of three broad academic course categories: Organizations, Performance, and Markets. Beginning in the second term, students choose from over 200 elective offerings to complete the rest of the curriculum. Students may assemble their own elective sequences, but can also refer to lists that the school provides of recommended courses for common career paths such as entrepreneurship, healthcare, marketing, media, real estate, value investing, and social enterprise. CBS enrolls 1,297 full-time MBA students, with 756 joining in 2018. The GMAT average for all students is currently 727, with 2018 students scoring 732. Students, on average, join the program with five years of previous work experience, are 39 percent female, and are 28-years old. About 97 percent of the most recent graduating class featured job offers within three months of graduation with a 92 percent acceptance rate. The average base salary of graduates is $125,000 and 66.3 percent received a signing bonus around $25,000. 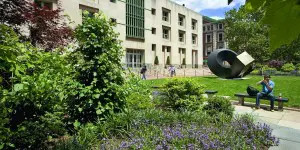 The tuition for the Columbia Business School full-time MBA is approximately $71,544. However, the total expected cost is $107,749 for the first year, which accounts for additional fees associated with room and board, books and supplies, health services and insurance, and personal expenses. All students who complete their applications by the merit fellowship consideration deadline and indicate that they would like to be considered for fellowships are eligible for merit-based fellowships that are granted on the basis of academic excellence, geographic and personal background, and professional experience. There are also a number of corporate-sponsored fellowships that provide opportunities for summer and post-MBA employment. In addition, CBS offers partial-tuition, need-based scholarships to both domestic and international candidates. Financial aid applications for August-entry students are due by March 1 or three weeks after a student is admitted, whichever date is later, and applications for January-entry students are due by October 15 or three weeks from the date of admission, whichever is later. These scholarship decisions are considered in the order in which they are received, so admitted students seeking need-based financial assistance should apply as soon as possible. CBS encourages U.S. citizens and permanent residents to apply for Federal Direct Stafford Loans or Federal Direct Graduate PLUS loans, which are available to students enrolled full or half time who maintain satisfactory academic progress. Domestic students can also apply for Columbia University institutional loans or for private, credit-based loans. The school offers private, credit-based loans to international students with a U.S. cosigner. Applicants must possess a bachelor’s degree. While there is no specific requirement for work experience, the majority of the class has at least one year of full-time work experience. Applicants must submit transcripts from each college or university they have attended, a GMAT or GRE score, two letters of recommendation, a $250 application fee, three essays, and a response to a short-answer question. International applicants who do not have a degree from an institution in which all instruction is conducted in English are required to submit the Test of English as a Foreign Language (TOEFL) or the Pearson Test of English (PTE). A select group of applicants may also be invited to interview with alumni or current students, often in the applicant’s geographic area.